Bokashipetcycle Supplemental Fermenters - Expand your processing Capacity! A supplemental fermenter allows users to process an additional 20 lbs of waste within each cycle so that fewer trips to the garden are required in a given time to process the waste by expanding the fermenting capacity for your bokashipetcycle system. The table below provides a useful guide to how many fermenters are required in processing pet waste. The minimum time required to process 20 lbs of waste is 1 week per fermenter. 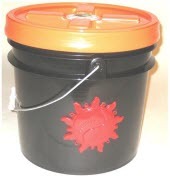 Add additional capacity to ferment pet waste in 3.5 gallon (US) [13.3 liters] increments. Each additional fermenter will increase processing capacity by ~ 20 pounds. Use with bokashi culture mix and the accelerant as directed in the instructions for the Petcycle waste disposal system.